The Summer Teacher Leadership Fellows joined artist Sabina Haque and students in PSU’s Middle East Partnership Initiative program for a printmaking workshop at Pacific Northwest College of the Arts. This summer the Museum welcomed two local educators as part of the inaugural Summer Teacher Leadership Fellows program. The program is a central part of the Museum’s Teacher Leadership Initiative, which develops and fosters an intentional learning community of K-12 teachers. The program allowed the Education Department to invite two K-12 teachers to be in residence at the Museum for one-month, full-time, paid positions. Teacher Leadership Fellows had the opportunity to get to know the Museum, explore its collections and resources, and make connections to their own teaching practices. Fellows collaborated with Museum staff on planning programs and creating resources to serve the needs of students and teachers across school communities. In building teachers as leaders within the Museum and their own schools, this Initiative further supports the Museum’s efforts to integrate the arts into classroom teaching. This new fellowship program as well as the broader Teacher Leadership Initiative were launched this year with generous support from the Oregon Community Foundation. Latina youth in the Adelante Mujeres Chicas program learned Mexican folkloric dancing with Sigrid Vilchis of Ballet Papalotl and studied Mesoamerican art with the Teacher Leadership Fellows. Franky Stebbins and Jessica Orellana were selected from more than 30 applicants to take part in the first year of this immersive program. Stebbins teaches Social Studies and English for Speakers of Other Languages at H.B. Lee Middle School in the Reynolds School District. Orellana is a World Language teacher at Rex Putnam High School in the North Clackamas School District, where she leads the Spanish Immersion program. Both teachers appreciate the way their students respond to visual art. The fellows studied works currently on view in the galleries and conducted research through Online Collections and in the Crumpacker Library. With the assistance of Curators Mary Weaver Chapin and Julia Dolan and Associate Registrar Anne Crouchley, Orellana and Stebbins arranged special viewings of prints and photographs in the Haber Study Room. Orellana chose to focus her work on Mesoamerican objects, and in particular those with a Mayan and Nahuatl influence. “As a Spanish teacher, I am always looking for ways to bring the culture from Latin America into the classroom,” said Orellana. During their time at the Museum, the fellows also participated and assisted in a number of Education Department programs. 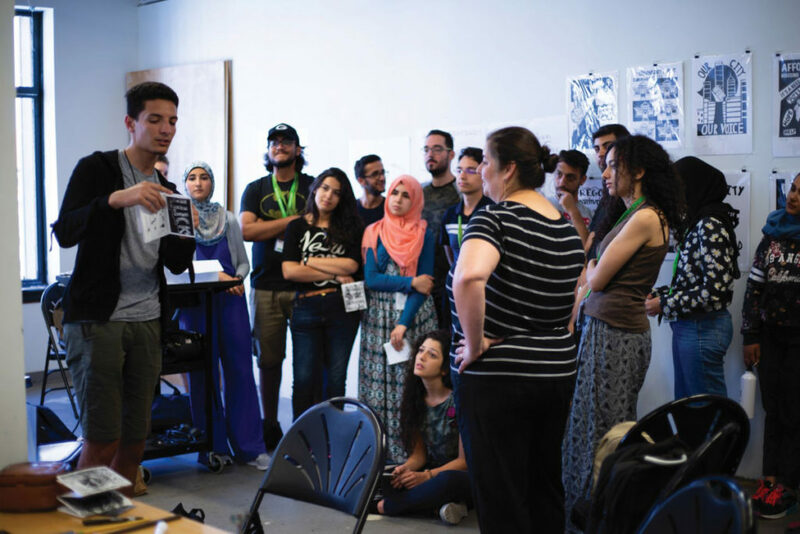 They made prints and zines with students in Portland State University’s Middle East Partnership Initiative program in a workshop led by Sabina Haque. 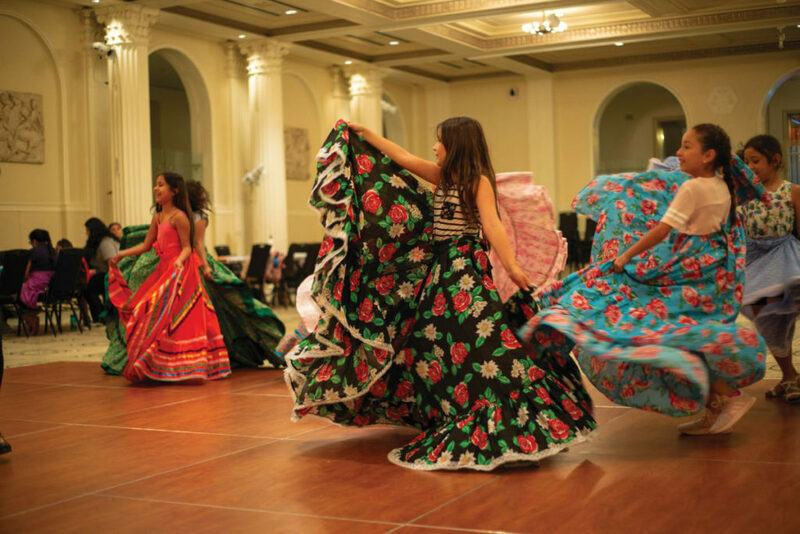 They designed and facilitated a bilingual program in the Native American and Mesoamerican galleries for 65 girls in the Adelante Mujeres Chicas summer camp. 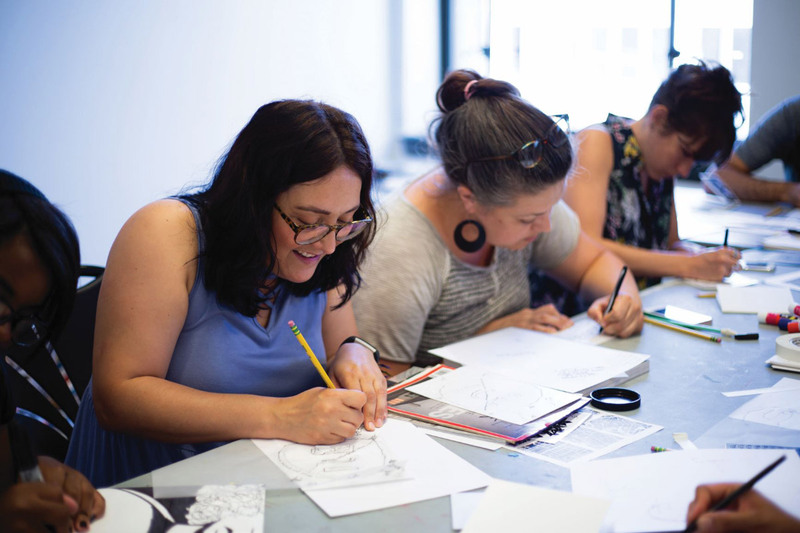 Teacher Fellows Jessica Orellana (left) and Franky Stebbins (center) created zines and prints in the Middle East Partnership Initiative workshop. Stebbins and Orellana will go on to join the 24-member Teacher Advisory Council this fall and share their learning with the wider community of educators engaged with the Museum. The Museum thanks the Oregon Community Foundation for its commitment to deepening community-based arts education for children and adults, and for its support of the Museum’s Summer Teacher Leadership Fellows program, which impacts teachers and students from all grade levels and disciplines across our school communities.